The Target VM step of the wizard is only available if you have chosen to fail back to the original VM restored in a different location. 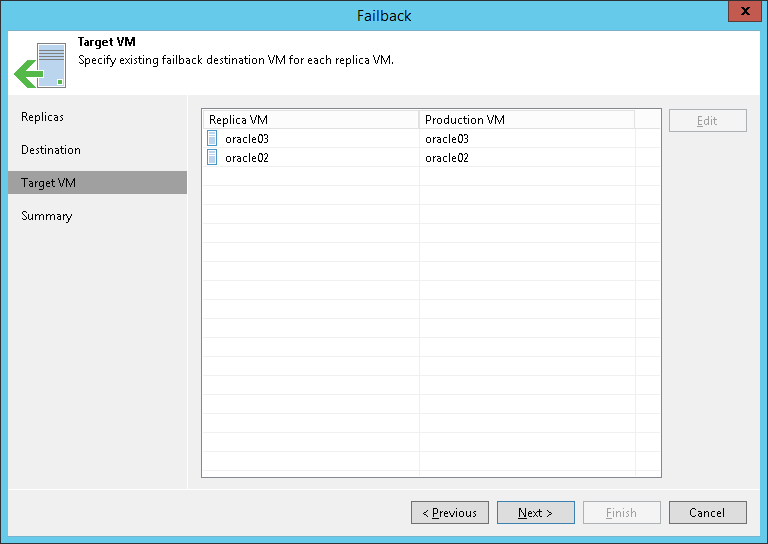 You can define how VM replicas map to VMs restored from backup. Select a replica in the list and click Edit. Select the restored VM from the virtual environment. To facilitate selection, use the search field at the bottom of the Select Objects window: click the button to the left of the field and select the necessary type of object to search for: Everything, Folder, Host Group, SCVMM, Cluster, Host or VM, enter an object’s name or a part of it and click the Start search button on the right or press [ENTER].